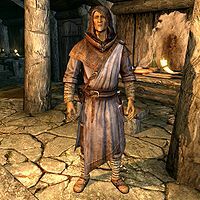 Nelacar is an Altmer sorcerer and former member of the College of Winterhold, currently living in the Frozen Hearth inn in Winterhold. He was asked to leave the college due to some failed experiments. He will ask you to bring him Azura's Star, a powerful soul gem which will not be destroyed upon usage and can be refilled an unlimited amount of times. 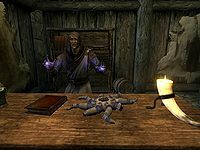 Nelacar will explain that a Dunmer named Malyn Varen fell incurably ill, and as he studied the gem, he became increasingly insane, eventually seeking immortality through use of the gem. Nelacar views the Daedra as evil, including Azura, especially in light of what transpired with Malyn Varen. He can be found inside The Frozen Hearth at all times. He will start his day at 6am and eat breakfast for one hour at 7am; he will then wander around both his room and the inn for the rest of the day, eating at 7pm and retiring to bed at midnight. He wears apprentice robes of Alteration, an apprentice hood, and a pair of boots, and he carries an unenchanted iron dagger. "This, this is why people have a problem with your college, Nelacar." Nelacar: "I'm sorry, could you describe the smell?" Dagur: "Like some horrible monster was turned inside out, and then exploded. What did you do?" Nelacar: "It was a minor miscalculation. I've already corrected it for future experiments." Dagur: "This, this is why people have a problem with your college, Nelacar." Dagur: "Is everything well, Nelacar?" Nelacar: "Oh yes, quite fine. My accommodations here continue to be just what I need." Dagur: "And there haven't been any... problems?" Nelacar: "Are you referring to your other customers? No, everything is quite alright. I expect a bit of animosity now and then." Dagur: "I see. Well, let me know if things get out of hand." When starting a conversation with him, he will say: "My days at the college are long behind me, but I prefer to stay close by." as well as: "Dagur and I have an understanding. He gives me my privacy, and I make sure my experiments don't blow up his inn." Asking him further if he is with the college, he will say: "No. Gods no, not for years. I left Winterhold for some time, and returned to stay here at the inn." Asking him why he stays at the inn, he will say: "I still have research that keeps me busy, and being here in Winterhold ensures I have access to former colleagues." If you are a member of the College of Winterhold, he may first say to you: "I don't deal with any College applicants these days, so don't bother asking." However, if you have already completed the quest and chose to repair the star through Azura, Nelacar will take a disgusted tone with you, saying: "I don't like doing business with Azura's faithful. Make it quick." Yet, if you have finished the quest using Nelacar instead of Azura, upon approaching him he will say: "Just glad all that business with Malyn is over with. What did you need?" 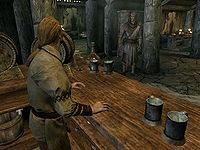 During the quest The Black Star, when asking members of the College of Winterhold about an Elven mage who studies stars, all of the College members you ask will point you in the direction of Nelacar. "A priestess of Azura sent me." (Persuade) Passed: "Azura? Gods, it's all finally coming back to haunt me." Failed: "You're working with the Daedra? Right. Now tell me the one about the Argonian Maid and the lusty baron." "Look, I'm willing to pay.'" (Bribe) Passed: "A few coins for my soul? If only you understood the irony." Failed: "I don't think you understand. I'm not answering questions." "I didn't agree to anything. Talk." (Intimidate) Passed: "Just calm down. I'll tell you everything." Failed: "Do you think muscling me is going to work? I'm a wizard. An old. Elven. Wizard. Think about it." "I misspoke. Forget I asked." Failed: "That's for the best." In any instance where you pass, he will continue, saying: "What do you know about soul gems?" You can either confirm that they're for enchanting, and he will say: "They are. Except the gem is always consumed. They're frail. Except for one." You can also ask him why he's asking, and he will say: "That's what caused all the trouble. Soul gems are used in enchanting, but they break afterwards. Except one." Instead, you can tell him not to change the subject, and he will snidely respond with: "Soul gems are the subject, friend. They're used in enchanting, then they break. Except one." Whichever option you pick, he will continue: "Azura's Star. A Daedric artifact that allows any number of souls to pass through it. Some of us wanted to find out how. I was working under Malyn Varen, then. If only we knew what he was really planning." Asking him what Malyn did, or telling him to get to the point, he will say: "Malyn wanted to alter the Star. He was dying. Disease. He thought he could store his own soul inside. Become immortal. It drove him mad. Students started dying. Eventually, the College exiled him. He took a few loyal disciples to Ilinalta's Deep and vanished. Look, I don't care who asked you to find the Star, but don't take it back to Azura. The Daedra are evil. They're the reason Malyn went insane." Asking him to explain how Azura's Star works, he will say: "I mentioned how the Star is a soul gem, only it never gets depleted? There's another rule the artifact follows. You can only store white souls in the Star, belonging to the lesser creatures. Azura's magic won't allow black souls to enter it. As a mortal, Malyn's soul was black, so part of his work was breaking past Azura's rules. He was close before... well, I already told you." If you choose to ask him about how Malyn Varen was driven insane, he will say: "Azura is no ordinary Daedra. She commands an entire realm inside of Oblivion. The more Malyn worked on the Star, the more she was able to damn him. It started slowly at first. Malyn would see things that weren't there. Then he would yell at students over words they hadn't said. Then one day I walked in and Malyn had... killed a student, and in a horrific moment of inspiration, he started using her soul for his work." You can then remark about how Malyn sounded like he got what he deserved, and Nelacar will say: "The College would agree with you, but do you have any idea how many innocent lives were cut short, just so Azura could have revenge? We're nothing to the Daedra. Pawns to move around, praise, and punish as they see fit." "He did it. He actually managed to trap his own soul inside the Star." Upon returning with the star, Nelacar will be in awe, stating: "Stendarr's Mercy. You found it. Azura's Star. Maybe this is my chance to make things right. I can finish Malyn's work, the way we had meant to before his madness. It would mean cutting the Star off from Azura. Only black souls would be able to enter it once we finished." You can then choose to start the next stage of the quest, or delay, saying you'd like to think about it; to which he will respond: "All right, but hurry. Who knows if Azura is watching us?" Choosing to continue, Nelacar will say "Are you ready to give me the star?" Once you hand him the star, he will say: "Give me a minute to examine the Star. I'll see what we need to do." He will then walk to his bar, saying "These fissures and cracks aren't encouraging. Malyn obviously was growing more desperate once he left the College." Placing the star on the bar counter, he will say: "He did it. He actually managed to trap his own soul inside the Star, but it's falling apart. It needs more souls to sustain itself." He will finish his analysis, and then straighten up, saying: "The Star is being used to sustain Malyn's soul. I can't fix it while that fragment of him is inside." Suggesting that you and Nelacar need to deal with Malyn somehow, he will say: "Precisely. But it's not as simple as enchanting Malyn away. He's put up barriers. Souls are only allowed in, not out. If we were to... somehow... send a soul inside the Star. One that was ready to overpower Malyn from the inside...." while suggesting that what you and him are planning would kill him will cause him to say: "He's already dead. Worse, the enchantment keeping him intact requires black souls. I don't know how many people he must have killed. If we don't do something, the enchantment will eventually fade, and the Star will slip back into Oblivion. Azura will have the last laugh." Catching on, you may remark that you don't like where this conversation is going, which Nelacar would largely ignore at first: "I could soul trap you. Place you inside the Star. Then bring you back once Malyn has been dealt with." However, asking him directly if he wants to send your soul into the Star, he will say: "A special type of soul trap. Placing you inside the Star without fully killing you. Once Malyn has been dealt with, I'll bring you back." Regardless of what you choose, he will finish by saying: "I understand if you need some time to prepare. Let me know when you're ready." Before entering the Star, you have the option of asking Nelacar about how your fate will differ from Malyn's, to which he will say: "Malyn's soul is beyond hope because his body is dead. But I'll be keeping you just slightly alive on this end. But be careful. If you die inside the Star, your soul will be disrupted. There's nothing anyone can do for you if that happens." Asking him what you would do once inside, he will say: "Malyn's soul should be in the Star. Theoretically, purging him will be just like killing a ghost anywhere else. I'll have a magical tether to your soul while you're inside. Once you're done, it'll be as simple as pulling you back into your body." Upon telling him that you're ready, he will take on a grave tone, and say: "Okay. Stand very still. This might sting." He will then affect you with magic, and continue his grave tone, saying "First, I'll need to grab hold of your soul. Now, take a deep breath." Once you have defeated Malyn, you will hear Nelacar's voice in your head: "Malyn's enchantments are broken. Hold on. I'm going to pull your soul out of there. Brace yourself." Upon returning to The Frozen Hearth, Nelacar will say: "Easy there. The numbness will pass. Just don't strain yourself. We've done it. The Star has been cut off from Azura, and Malyn's soul finally has some measure of peace, even if it is in non-existence." You can then either ask him what should be done with it now, which he will respond to with: "Now? You could use it for what we meant it for. Using black souls for enchanting. The Black Star will never decay, but it can no longer hold the white souls of lesser creatures. You keep it. I'd sooner finally put this chapter of my life behind me. Congratulations. You've changed the fate of a Daedric artifact and lived." or, you can tell him that since it's fixed, it belongs to you, in which he will give you a shorter version of that response: "Go ahead. Take it. I'd sooner finally put this chapter of my life behind me. Congratulations. You've altered the fate of a Daedric artifact and lived." This is the merchandise found in Nelacar's merchant chest. These items are only available if purchased from the merchant; they cannot be pickpocketed or stolen. They are restocked every two days. There is an Altmer mage named Nelacar in Morrowind. This page was last modified on 25 August 2014, at 13:13.